Canadian actor Michael Greyeyes's wedding with wife garnished his life with bliss and happiness along with the company of his children. The family even watched his own movie together. The Saskatchewan native is mostly known for his appearance as Qaletaqa Walker in the film Fear the Walking Dead. He got global recognition after featuring in movies such as Dr. Quinn Medicine Woman, Texas Ranger, and Walker. For his alluring performance on the series, he was nominated for Saturn Award for Best Guest Performance in a Television Series in 2017. Michael also landed the voice role of the main character, Domasi Tawodi (Tommy) on the first-person shooter survival horror video game, Prey, released in 2006. 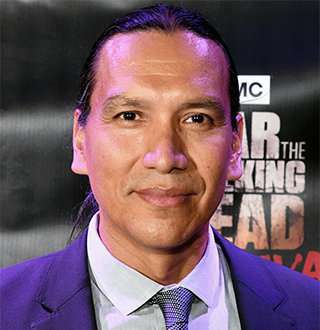 Born on 4 June 1967, Michael Greyeyes is Plain Cree, a dialect of the Algonquian language, Cree, which is the most populous Canadian indigenous language from the Muskeg Lake First Nation in Saskatchewan. Likewise, his parents were from the Muskeg Lake First Nation and the Sweetgrass First Nation, both located in Saskatchewan. He spent his early age along with his sister in Saskatoon. Read Also: Alleged Gay Tyler Young Flaunts Adorable Dating Affair, Not With Boyfriend Though! The Kent State University graduate, Michael completed his master’s degree in FA (Fine Arts) at the School of Theatre and Dance in May 2003. He is also a ballet dancer who graduated from The National Ballet Dancer in 1984. In 1987, he went on to apprentice with The National Ballet of Canada before joining the company as a Corps de Ballet member. He then moved on to NY to join the company of choreography Eliot Feld in 1990. Michael started his acting career at the age of 26 in TNT’s Geronimo in 1993. Since then he has made several TV appearances and guest performances as well. Some of his films work include the portrayal of Sitting Bull in the forthcoming feature Woman Walks Ahead. He is also a cast member of AMC Television’s third season of Fear The Walking Dead. Moreover, he has appeared in numerous feature films like The New World, Skipped Parts, Passchendaele, and Dance Me Outside. Likewise, his television credit includes Law and Order: Criminal Intent, Crazy Horse, Tecumseh’s Vision, Klondike, Saints and Strangers, and Dream Keeper. Not just an actor, Michael is a director as well. In 2010, he founded Signal Theatre, a company that explores intercultural and transdisciplinary live performance. As Artistic Director and choreographer, his major creation includes From thine eyes (Harbourfront Centre), Nôhkom (The Banff Centre), and A Soldier's Tale. He even teaches theatre as an Associate Professor at the York University. With a handful of jobs and accomplishments in acting career, Michael owns a net worth that has a figure in millions. However, the exact value of his net worth remains confined to date. As for his love-life, Michael is in a blissful relationship with his dancer wife, Nancy Latoszewski. He had first met his wife at Eliot Feld's company in New York where he used to work as a choreographer. The pair found love for each other and eventually married. The couple had a secret wedding and have yet to disclose more information about their nuptials. Interesting: Terrell Brown With Partner At Age 29? Wedding And Wife En Route? Nevertheless, it is clear that their wedding brought bliss in their life, as the couple has seen their bio expand as parents, having welcomed their daughters, Eva, and Lilia in 2002 and 2004 respectively. Michael spends quality time with his family members and even shares some of his family glimpses on his social media accounts. On 7 May 2018, Michael tweeted on his Twitter revealing that he had watched his movie, Dance Me Outside with his daughters. He also disclosed that his daughters were blown away by the classiness of the movie and also the fact their father looked like a baby. While Michael and his wife replenish their time together with family, their 13-year-old younger daughter, Lilia appears to be following the footsteps of their parents: both Michael and Eliot were dancers. Lilia has enrolled at Canada's National Ballet School and trains 19 hours weekly. In her leisure time, she plays with their family dogs, Teddy and Scout, and spends time with family members at their lavish house. Disney Star Ethan Wacker Wiki At Age 16; Height, Birthday, Family, Net Worth All Revealed!